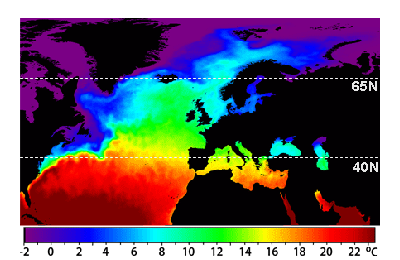 For the last few years, observers have been speculating about when the North Atlantic will start the next phase shift from warm to cold. The AMO Index is from from Kaplan SST v2, the unaltered and untrended dataset. By definition, the data are monthly average SSTs interpolated to a 5×5 grid over the North Atlantic basically 0 to 70N. The graph shows warming began after 1992 up to 1998, with a series of matching years since. August is the hottest month in the dataset, and note the considerable drop from 2017 to August 2018. Because McCarthy refers to hints of cooling to come in the N. Atlantic, let’s take a closer look at some AMO years in the last 2 decades. This graph shows monthly AMO temps for some important years. The Peak years were 1998, 2010 and 2016, with the latter emphasized as the most recent. The other years show lesser warming, with 2007 emphasized as the coolest in the last 20 years. Note the red 2018 line is at the bottom of all these tracks. Most recently August 2018 is 0.34C lower than August 2016, and is the coolest August since 2007. With all the talk of AMOC slowing down and a phase shift in the North Atlantic, we await SST measurements for August and September to confirm that cooling has set in. As of August, the momentum is certainly heading downward, despite the band of warming ocean that gave rise to now receding European heat waves. Thanks Ron for the update. Thanks pethefin. As you can see, I prefer the unaltered, undetrended AMO dataset: no anomalies, just the temps. Pingback: Weekly Climate and Energy News Roundup #328 | Watts Up With That?